Isn't it gorgeous? It's a merino, silk, cashmere blend. 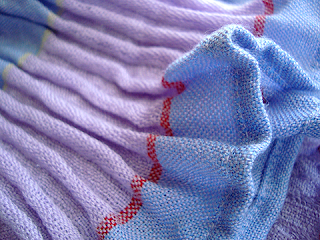 The pleats are formed as part of the fabric, while it's woven. Very clever, and beautiful. Watching the Aussie lose their one day cricket match, and heading outside for a BBQ soon. Happy Aussie Day all! Happy Australia Day to you too Jejune. 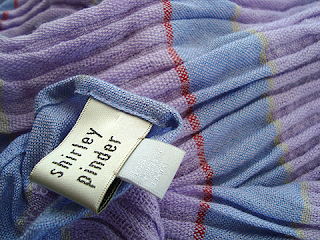 The Shirley Pinder wrap is lovely and so is her site. Lucky you! Happy Australia Day to you too. That's a beautiful scarf/wrap. I love the pleats!! That is really cool, isn't it! Love the colours too. oh it's lovely. What a gorgeous gift! Yummy! 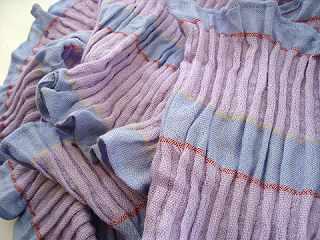 Silk and cashmere and such delicious colors. Perfect for you! How very OO LA LA. I love the colours. Happy belated Australia day to you! Happy Belated Aussie Day to you. I hope the bbq was tasty. What a beautiful shawl/wrap. The colors are great and versatile and it sounds so soft. That is truly a beautiful wrap, what a lovely gift.